You must make an offering of a bear or wolf pelt... and the horn of a Unicorn. Once you have reached level 17, speak with Vajhira to find out that you will need a Wolf or Bear pelt as an offering to Hircine. Hircine requests that you bring him a Unicorn Horn. Kill the Unicorn in Harcane Grove and retrieve its horn. Bring the horn back to Hircine to receive your reward: the Saviour's Hide Cuirass. 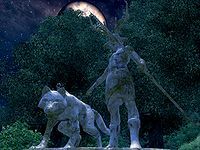 Hircine's Shrine is located in the Great Forest, south of the Imperial City. Speaking to Ontus Vanin using the topic "Daedric shrines"; you must have already read Modern Heretics or have spoken with Ulene Hlervu about "Cheydinhal". Summoned by prey. The hare crouches before the fox's muzzle. Perhaps I shall task you, mortal. Set you to hunt for my amusement. In Harcane Grove is a quarry worthy of the chase. First named, last tamed, the unicorn runs wild there. Bring me this creature's horn, mortal. If you dare. The Unicorn is in Harcane Grove to the south-southeast of the shrine. There are three leveled Minotaurs of the Grove guarding the Unicorn. You do not have to kill the minotaurs. However, killing the minotaurs one at a time out of sight of the Unicorn makes it easier to complete the quest. Use the Wabbajack on the Unicorn, which can turn it into a weaker creature. Bring essential followers to share your combat duties. You can ride the Unicorn to a town and place the Unicorn in the paddock next to the town's stable. You can freely attack the Unicorn from outside the stable with ranged attacks; it will not be able to hurt you. (Note that riding the Unicorn turns it into your active horse, as detailed in the Unicorn article). 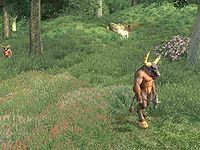 Ride the Unicorn to an Oblivion Gate or any other location with hostile creatures or NPCs, and let the enemies attack the Unicorn for you (as long as you do not draw your weapon, the Unicorn will engage anyone who is attacking). Conversely, lead an attacking creature/NPC to the unicorn. Ride the Unicorn off a bridge or cliff into deep water. The momentum will ensure you plunge beneath the water's surface; remain underwater (using Water Breathing on yourself) until the Unicorn drowns. Do not dismount as the Unicorn will automatically swim to the surface. Riding into the water from the water's edge does not work because you cannot go underwater. Perhaps the most readily available method is simply to repeatedly leap off cliffs/down hills (while riding the Unicorn) until it dies from fall damage. The unicorn is a "long creature" and cannot quickly pivot to face you the way humanoids do. While it is turning, you can step to the side ("strafe") to continue to flank it and hit it on the rump. The unicorn likes to do power attacks by rearing up and thrusting its horn. This, however, is a slow attack and you can often step back out of range and possibly dart in for an attack with a (long) weapon while its attack animation is finishing up. Yes, hunter, make your offering. Did you taste its flesh and drink its blood? Never waste the spoils of a kill. You've pleased me, hunter. Take my token, and wear it well. Hereafter, take your prey, and whisper my name. You do not have to be at level 17 for the Unicorn to appear in the Grove. You can ride or kill the Unicorn at any point in the game. However, killing the Unicorn is no easier at low levels (the Unicorn's statistics are not leveled). Also, once you have obtained the Unicorn Horn it is a quest item which, while weightless, still cannot be removed from your inventory until you complete this quest. There are Bear pelts in many places in Oblivion, not all of which are sure to appear. However the easiest sure location is at the top right of the stairs in the Cheydinhal Fighters Guild. Soran's Journal, added by the Wild Horses Creation for Skyrim Special Edition, mentions that the Unicorn you kill during this quest is actually the last one in existence, rendering the species extinct. 20 After I made the required offering, Hircine was summoned, and spoke to me. He told me that he desires the horn of a unicorn. I may be able to find a unicorn in the Harcane Grove. 30 I have killed the unicorn and retrieved its horn. I should return to the shrine of Hircine. 100 Finishes quest Hircine was impressed with my skill in hunting the unicorn. He has rewarded me with the Savior's Hide. It is possible to use the console to advance through the quest by entering setstage DAHircine stage, where stage is the number of the stage you wish to complete. It is not possible to un-complete (i.e. go back) quest stages. See SetStage for more information. This page was last modified on 19 October 2018, at 22:02.